See photos of our exciting new Interceptor 11M on Flickr. A tough, lightweight aluminum patrol boat, the high speed Interceptor 11M is available in outboard or inboard configurations, with many commercial-grade options available. The 11M Long Range Interceptor was designed for interception of high speed target craft, vessel board and seizure, rescue, and recovery. 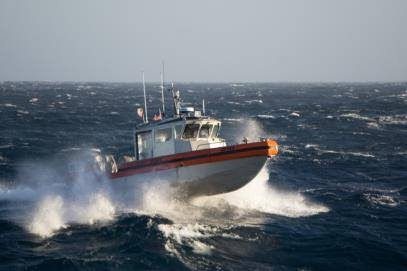 The Long Range Interceptor hull shape is based on very high loading, operations in very rough conditions of Sea State 5 survivable SS6 and ramp recovery aboard the National Security Cutters of the US Coast Guard. The ramp recovery objective was 9 knots and she has been tested to 12 knots. Part of the amazing control she has is due to the Ultra Jet Jetmaster joystick control system. 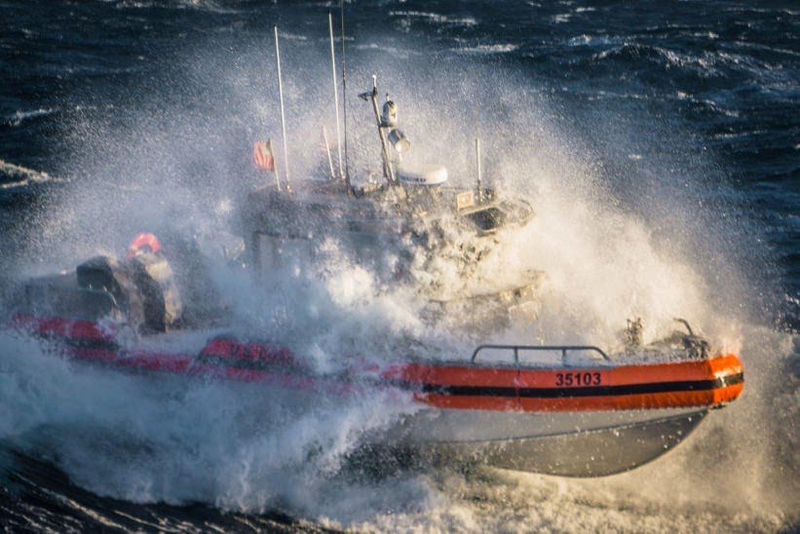 Her rough water performance with an amazing as shown in our web pics. To handle such rough seas at speed she has a very fine bow entry and elongated waterline and bow curve. The forward bustle has a wave brake built into the face to break up green water on deck. The hull is designed in excess of ABS (American Bureau of Shipping) as she sometimes comes in contact with the ramp sill when the ship is rolling in heavy seas. To accommodate her high payload and static stability requirements for small craft boarding she has an overwide beam with all intact stability calculated with her over built hull shape only. The collar is not part of the stability calculations. With the collar not needed in the water to meet stability requirements the customer saves greatly by having much fewer collar failures due to salt water degradation. This trend of having the collar clear of the water continues as Coast Guards and Marine Enforcement Agencies worldwide grapple with tight budgets. A full collar replacement for a single boat can be in the tens of thousands of dollars. Subject to customer objectives the boat can be fitted with several gun arrangements and ballistic protection. The LRI II version has 50 caliber gum mounts fore and aft and uses the bow and towpost as the gun mount base. The US Coast Guard chose to use portable ballistic panels so as not to carry around so much weight continuously which slows the boat speed and over uses fuel. The portable kit which is stowed on board the ship can be mounted in under 10 minutes on board the vessel. The boat is offered with four types of fendering/flotation collars, full air with or without auto inflation system, D-shaped air to provide wider inboard deck space, D-shaped foam or foam/air hybrid. The boat is built to Mil specs and exceeds ISO 12215 construction standards for high speed boats. The hull shape does not require its collar for intact stability and meets ISO 12217 Class B stability requirements. Commercial off the shelf availability. Structure to ABS High Speed Guide. Stability to 46 CFR 28.565. Designed for stern launch and recovery. Single point/Gantry Crane lifting points. 22” collar for up to 9 knot impact. High payload capacity up to 15 passengers. Outboard option up to 3x300 HP.